(Nanowerk News) Two-dimensional (2D) materials such as molybdenum-disulfide (MoS2) are attracting much attention for future electronic and photonic applications ranging from high-performance computing to flexible and pervasive sensors and optoelectronics. But in order for their promise to be realized, scientists need to understand how the performance of devices made with 2D materials is affected by different kinds of metal electrical contacts. Researchers in NIST's Physical Measurement Laboratory (PML)'s Semiconductor & Dimensional Metrology Division, in collaboration with researchers from George Mason University, compared silver and titanium contacts on MoS2 transistors to determine the influence of the metal–MoS2 interface. A sophisticated suite of measurements (Raman spectroscopy, scanning electron microscopy and atomic force microscopy) was used to characterize the surface morphology and the interface between MoS2 and the metals, the properties of which affect the device behavior. 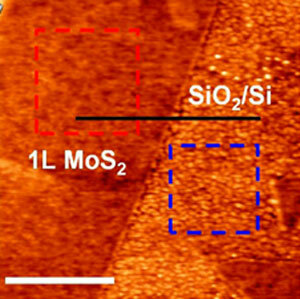 It was found ("Influence of Metal-MoS2 Interface on MoS2 Transistor Performance: Comparison of Ag and Ti Contacts") that silver provides a much better electrical contact to MoS2 than the widely used titanium, with the silver-contact devices having 60 times higher current when the device is in the "on" state. These results are another step towards the advanced manufacture of high-value products based on 2D materials.